BentoLunch.net - What's for lunch at our house: Preschool Snack Bento #26 - Monday's Melons, & Muffins, & Mickey, Oh My! 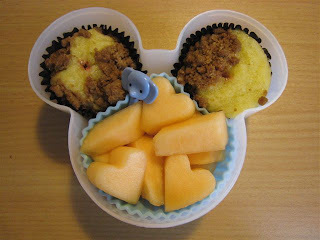 Preschool Snack Bento #26 - Monday's Melons, & Muffins, & Mickey, Oh My! It's alliteration Monday! ;o) I like alliteration. And honestly, it's not always easy to come up with alliterative bentos. This one wasn't even on purpose, which makes it that much more amusing. For preschool, Mr. Ben had two mini muffins that were some sort of raspberry filled coffee cakes along with canteloupe (a few hearts because Mommy loves him) and his very favorite "Peanut" pick. The muffins fit perfectly in the ears of a Mickey shaped box we had which also made Ben happy. Love the mickey shaped box! Hope your son loved his snack, it looks super yummy! Nice. I'll have you know that I've been making little bentos for my 3 year old daughter based on the ones you make. So far it's worked out good but I have to make them four hours before she eats them so somethings (like mixing cookies/crackers with fruit) don't work so well. That is really, really cute! We have the same box but I can't figure out how to put multiple things in it without them getting mixed up. If I did what you did the cantelope would end up on the muffins....how do you do yours? The lid fits pretty tight and the canteloupe is in a separate muffin liner. There's just minimal space between top of the food and the lid. I can't do it with all containers, but the Mickey one works well for that.